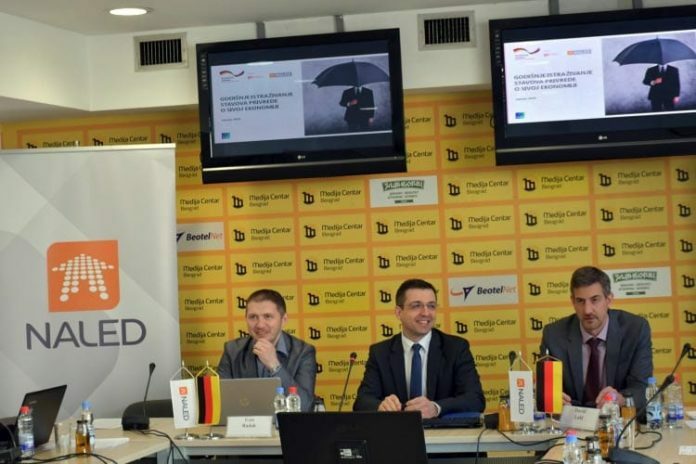 NALED, in cooperation with Ipsos Strategic Marketing and with the support of German Development Cooperation, 252 companies have been surveyed over a period from 18 December 2018 to 24 January 2019 on the shadow economy. Results have been presented in the Media centre in Belgrade. Businesses have various opinions about business conditions in Serbia. Slightly more than a half (54%) find these conditions poor, but around 30% believe they have been improved over the past year, particularly in the field of countering unfair competition, while even 78% indicate the shadow economy has been reduced, the survey shows. – The reduced tax burden on labour and stimulating measures for legal business as opposed to those repressive, remain one of NALED’s and Fair Competition Alliance’s priorities. We expect that this to be reflected in the new National program and the Action plan for countering shadow economy the Government of Serbia should adopt by late March – said Igor Lončarević, Vice President of the Alliance and the Head of Tax and Legal Affairs in KPMG. Business owners and directors even more strongly highlight the high labour taxes and contributions as the main cause of illegal work – 79% compared to 62% a year ago. Even though only 5% are ready to admit they have difficulties with paying taxes and contributions for their employees, they estimate that, in their area of work, taxes and contributions are partly or entirely not paid for as much as 25% of employees. – One of the most important incentive measures we implemented together with NALED is the introduction of tax exemption for new businesses and this measure was used by 470 entrepreneurs from 31 local governments during the first 3 months upon launching. We organized info days in six cities to promote the measure, we prepared informative materials and launched a website which already generated 30,000 visits – said David Lahl, Project Manager of German Development Cooperation’s “Public Administration Reform – Financing the 2030 Agenda” project, implemented by GIZ. The research results have shown that even 71% of businesses know about this measure, while 87% think it will encourage individual or most businesses to register and leave the shadow zone. Businesses stress that the sectors of construction, trade, hospitality and law practice include the highest shadow economy scopes. Compared to previous research, there is a notable improvement regarding the trust in inspections. Nearly two-thirds of businesses believe the new Law on Inspection Oversight has improved the process of revealing and punishing the non-registered businesses, while the per cent of those who believe a business operating in the shadow zone will be revealed, punished and fined has doubled since 2015 (17% compared to 9%). On the other hand, businesses still do not recognize their role in countering shadow economy. Only 32% businesses would report unfair competition as they believe that the process of identifying non-registered businesses should be the job of the state, or they think the punishments would not have effect. They explain the existence of non-registered businesses with the state’s lack of capacities to handle this issue, as well as political protection and corruption.